A flash flood hits the southern Iranian city of Shiraz, March 25, 2019, causing cars to pile up on a road near its historic Quran Gate. Iranian state media say flash floods killed 20 people in several regions on Monday, as Iranian social media users criticized the nation’s president and local authorities for their handling of the disaster. A spokesman for Iran's Crisis Management Organization told state news channel IRINN that 25 of the nation’s 31 provinces were hit by Monday’s floods. 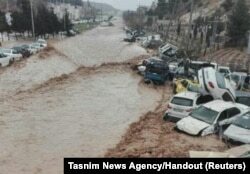 Iran’s semi-official Tasnim news agency quoted another emergency official as saying 18 people were killed in a flash flood that struck the southern city of Shiraz. The official who spoke to IRINN said flooding killed two other people in the western provinces of Lorestan and Kermanshah. Vehicles are stacked one against another after a flash flooding In Shiraz, Iran, March 25, 2019. VOA Persian received and verified video of the Shiraz flood from social media users in Iran. One video clip showed cars being swept away on a road near the historic Quran Gate at the city’s northwestern entrance. Another video received and verified by VOA Persian showed floodwaters destroying a bridge in the city of Khorramabad in the western province of Lorestan on Monday. Iran’s semi-official Fars news agency reported that President Hassan Rouhani returned to Tehran on Monday to deal with the crisis after spending the Persian New Year holiday on the southern Iranian island of Qeshm. The Fars report said ineffective or absent local authorities were to blame for the social media criticisms of the government’s response to the floods. But some of those social media critics pointed the finger of responsibility at Rouhani for not dealing with the situation faster. Iranian Vice President Eshaq Jahangiri fired the governor of the northeastern province of Golestan, Manaf Hashemi, on Saturday for being abroad as that region struggled with days of heavy flooding. A Saturday report by the Iranian judiciary’s Mizan news agency said judiciary chief Ebrahim Raisi ordered his staff to travel to flood-hit areas to investigate cases of negligence in flood preparations and weaknesses in the flood disaster responses of Iranian authorities.